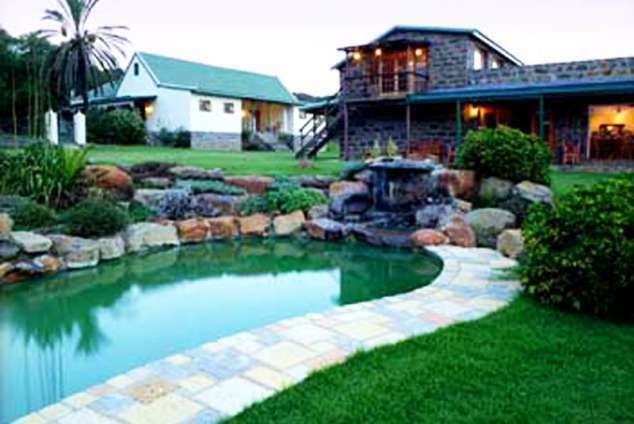 Spion Kop Lodge - Winterton Accommodation. Greetings from Spion Kop Lodge in sunny in Kwa Zulu Natal, South Africa. I would like to introduce you to our unique Lodge. Imagine yourself on the summit of the rugged and historic Spion Kop Mountain as the sun goes down, and looming shadows fall as the moon rises! Awesome! Below is an introduction to our beautiful lodge and what it is that we offer. We have become a destination for our guests, (especially our return guests ) - due to the diversity of activities which we offer and our guests generally stay three or four nights, in order to allow themselves time to do justice to this area. Once you have read my mail, perhaps you would like to get back to me, should you have any queries. Spion Kop Lodge offers an out of Africa experience and is set against the back drop of the majestic Drakensberg Mountains (a world heritage site) in Kwa Zulu Natal, overlooking the Battlefield of Spion Kop, and adjacent to The Spioenkop Nature Reserve. (rhino,giraffe ,etc.). Minutes away from one of the most beautiful golf courses in Kwa Zulu Natal, on an expansive 700 hectare game farm, which was once the headquarters of the Commander-in-Chief of the British Forces, General Sir Redvers Buller, in the relief of Ladysmith Campaign, during the South African War of 1899-1902, was established by owners Raymond and Lynette Heron in 1998, a family operation . Situated twenty minutes off the N3 linking Durban and Johannesburg. Just two and a half hours from Durban and three and a half hours from Johannesburg. A tarred road all the way. The Lodge, which has a 4 STAR GRADING, comprises of the original homestead with beautifully appointed ensuite (bath and shower) bedrooms, each with it's own veranda looking onto the garden. The full-board tariff is R1300.00pp.per day.The main building houses a small but well appointed library, containing many historic books, a lounge with a fire place and a sunroom in which to relax. We have two private, with fire -places, sleeping 4 and 5 guests. The larger cottage, Acacia has two bedrooms and two bathrooms, plus a smaller bedroom. Aloe cottage is ideal for a family of four, and has one double bedroom and a smaller bedroom with twin beds. The original barn has been converted into a reception area, dinning room and cosy pub. Added to this we have a small but well-appointed Conference Room for smaller corporate conferences. We have a water hole in front of the deck, the birds are amazing! Experience the ultimate in relaxation and tranquillity, lazing in the pool, as you watch the spectacular sunsets, or just sit on the deck and absorb the serenity of your beautiful surroundings, or amble along the birding trail to the recently constructed water-hole. Spionkop was the scene of one of the bloodiest and perhaps, most futile battles fought during the South African War of 1899-1902. This theatre of war, was to bring together three significant, influential characters from the chapters of modern history, namely, Winston Churchill, a 23 year old war correspondent, Louis Botha who was to become the first Prime Minister of the Union of South Africa in 1910, and a London qualified lawyer, Mahatma Gandhi, who was a stretcher bearer with the volunteer Ambulance Core. One end of the Anfield Football Stadium in Liverpool, is known as the "KOP ", in honour of the Liverpool soldiers who fought and lost their lives during the Battle of Spion Kop . As the Farm is of great historic significance, we specialise in trips to the Battlefields, Spion Kop, Colenso and Ladysmith. Raymond will bring the battles alive in the theatre of your mind, with his ability as a raconteur and passion for the story and this area. He will also instil an interest in birding and nature as you meander through this historic valley on your journey into the past, as you relive the events of that fateful battle! Battlefield Trips: Spion Kop Battle Experience (four and a half hours). Colenso. Ladysmith. Churchill Capture Site etc. (full day). Birding (274 species, including the White Backed Night Heron). Sunset & Sunrise Boat Cruises (game and bird viewing, rhino etc.). Game Drives. Helicopter flip through the Drakensberg Astronomy Hiking. Canoeing. White Water Rafting Day trip. Horse Riding Amongst the Game in the Reserve even for the inexperienced rider. Drakensberg Boy's Choir Recitals. Tours to the Bushmen Caves and Paintings. Falconry Birds of Prey display. Hiking trips into the Drakensberg Mountains. Spion Kop Lodge - Durban Airport Spion Kop Lodge - Johannesburg International Airport Guided Tours of Isandlwana and Rorke's Drift - The Anglo-Zulu Battles can be arranged on request. Transfer from Spion Kop Lodge to Isandlwana and back. Transfers from Spion Kop Lodge to Dundee. If necessary transport to and from airports is available. However, as we are on a direct route, it is really easy to find us. Should you require any advice or guidance for your intended trip please do not hesitate to ask us. Should you wish to be collected at an airport and driven around our beautiful Kwa Zulu Natal, we are able to offer this option with our qualified Tour Guide. We specialize in service to the clients . "Arrive as guests, leave as friends!". I hope that you find the above information useful. I look forward to hearing from you in the not too distant future. I have taken the liberty of sending you a few photographs of the lodge and the farm and our neighbouring reserve. Please do not hesitate to contact me if there are any further details which you might need. "Yesterday is already a dream, and tomorrow is only a vision, today well lived makes every yesterday a dream of happiness and every tomorrow a vision of hope". Have a fantastic week, may it be spent in the company of someone special! 35711 page views since 20 Jul, 2005. Last updated on 19 Oct, 2018.